Michigan State University and Old Blue Jacket ROCK! 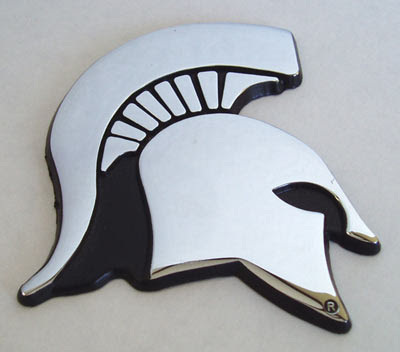 Hooray for Michigan State University (The Spartans) and Professor Wichman!!! Well, what do we have here? Looks like a small case of some people being able to dish it out but not take it. Let’s start at the top. The story begins at Michigan State University with a mechanical engineering professor named Indrek Wichman. Wichman sent an email to the Muslim Student’s Association. The email was in response to the students protest of the Danish cartoons that portrayed the prophet mohammed as a terrorist. The group had complained the cartoons were “hate speech”. As a professor of Mechanical Engineering here at MSU I intend to protest your protest. I am offended not by cartoons, but by more mundane things like beheadings of civilians, cowardly attacks on public buildings, suicide murders, murders of Catholic priests (the latest in Turkey ), burnings of Christian churches, the continued persecution of Coptic Christians in Egypt, the imposition of Sharia law on non-Muslims, the rapes of Scandinavian girls and women (called “whores” in your culture), the murder of film directors in Holland, and the rioting and looting in Paris, France. This is what offends me, a soft-spoken person and academic, and many, many of my colleagues. I counsel you dissatisfied, aggressive, brutal, and uncivilized slave-trading Muslims to be very aware of this as you proceed with your infantile “protests.” If you do not like the values of the West-see the First Amendment-you are free to leave. I hope for God’s sake that most of you choose that option. Well! As you can imagine, the Muslim group at the university didn’t like this too well. They’re demanding Wichman be reprimanded and impose mandatory diversity training for faculty and a seminar on hate and discrimination for all freshmen. How nice. But now the Michigan chapter of CAIR has jumped into the fray. CAIR, the Council on American-Islamic Relations, apparently doesn’t believe the good professor had the right to express his opinion. For its part, the university is standing its ground. They say the email was private, and they don’t intend to publicly condemn his remarks. That will probably change. Wichman says he never intended the email to be made public and wouldn’t have used the same strong language if he’d known it was going to get out. How’s the left going to handle this one? If you’re in favor of the Freedom of Speech as in the case of Ward Churchill, will the same protections be demanded for Indrek Wichman? I doubt it. I think Professor Wichman sums it up quite nicely. Another site brought to my attention by Snooper at A Newt One is called Old Blue Jacket and he has a great line of anti-hillary stuff as well as some common sense articles on this issue. I’m “borrowing” some of OBJ’s pictures and text, but you really should go over there yourself and check out his whole site. 1. Muslims fly commercial airliners into buildings in New York City. No Muslim outrage. 2. Muslim officials block the exit where school girls are trying to escape a burning building because their faces were exposed. No Muslim outrage. 3. Muslims cut off the heads of three teenaged girls on their way to school in Indonesia. A Christian school. No Muslim outrage. 4. Muslims murder teachers trying to teach Muslim children in Iraq. No Muslim outrage. 5. Muslims murder over 80 tourists with car bombs outside cafes and hotels in Egypt. No Muslim outrage. 6. A Muslim attacks a missionary children’s school in India. Kills six. No Muslim outrage. 7. Muslims slaughter hundreds of children and teachers in Beslan, Russia. Muslims shoot children in the back. No Muslim outrage. 8. Let’s go way back. Muslims kidnap and kill athletes at the Munich Summer Olympics. No Muslim outrage. 9. 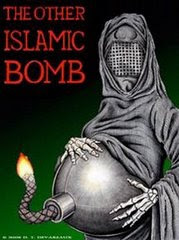 Muslims fire rocket-propelled grenades into schools full of children in Israel. No Muslim outrage. 10. Muslims murder more than 50 commuters in attacks on London subways and buses. Over 700 are injured. No Muslim outrage. 11. Muslims massacre dozens of innocents at a Passover Seder. No Muslim outrage. 12. Muslims murder innocent vacationers in Bali. No Muslim outrage. 13. Muslim newspapers publish anti-Semitic cartoons. No Muslim outrage. 14. Muslims are involved, on one side or the other, in almost every one of the 125+ shooting wars around the world. No Muslim outrage. 15. Muslims beat the charred bodies of Western civilians with their shoes, then hang them from a bridge. No Muslim outrage. 16. Newspapers in Denmark and Norway publish cartoons depicting Mohammed. Muslims are outraged. Dead children. Dead tourists. Dead teachers. Dead doctors and nurses. Death, destruction and mayhem around the world at the hands of Muslims .. no Muslim outrage .. but publish a cartoon depicting Mohammed with a bomb in his turban and all hell breaks loose. Now, every time I post anything remotely resembling the truth, the trolls come out from the left and from muslims trying to “sway” me, and on and on. Let me state, UNEQUIVOCALLY, I don’t want to hear it. I’ve got an on-going series here, posted by Ben, called “Myth vs. Fact”. I have another series, also posted by Ben, called “Know Thine Enemy” as well as an entire section called “Exposing Islam”. I am NOT swayed by the lying cant and hyperbole of “religion of peace”. I have asked REPEATEDLY for verses to counteract what has been posted (as I will GLADLY give equal time) and been met with…silence. So, I don’t want to hear it. You can find the series’ and the sites in the sidebar–they have their own sections. Nor do I want anyone providing me a link to “Muslims Against Sharia”…they have been exposed as the CAIR front group they are in previous posts of mine (here and here), wherein they show themselves as incapable of arguing definitely for the case of “a religion of peace” and indeed degenerate into the frothing, rabid, terrorist lovers they are. They refuse to answer point blank questions and keep referring you to their website (if I wanted to go read the site–which I have–I would do so.). The fact is they can’t defend their purported stand in a coherent, educated fashion for themselves, degenerate into profanity and screech go to their site. No, answer the damn questions off the cuff as an educated, passionate, dedicated person would. 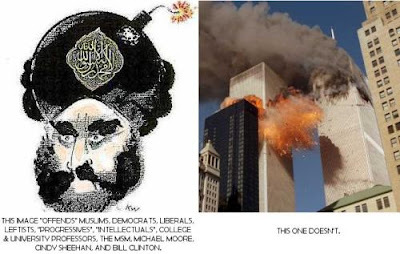 It’s about time Americans woke up to the dangers of appeasing this degenerate, misogynistic, child molesting advocating, violence loving, barbaric zealotry style of an ideology as well as the fact it is no more a religion than my dog’s bowel movements. It is in fact a societal ideology and not a religion at all. Further, take a good look at every place these “peace loving” people have claimed or are in the process of claiming (Britain comes to mind). While they may have contributed to science and the arts in ancient times, they have become irrelevant since oh, say the 7th century. Every place they live looks like a moonscape from their destruction, bombings, war, etc. They are not productive in the least–except in procreating and indulging in child abuse in their methods of indoctrinating the next generation into the hate. They are a blight on the face of the earth and until the “calm moderates” decide to speak out against the violence, they have no one to blame but themselves when they are lumped in with the more violent followers. How can we know they are truly “moderate and peace loving” if we don’t hear from them–definitively and en masse? If there are moderates out there who want a forum to let their voices be heard, I’m more than happy to provide that forum and equal time. Until that time comes, until someone steps forward and provides me the passages I’ve requested repeatedly, until then–don’t expect me to distinguish between the so-called radicals and the so-called moderates. Until then, they are one and the same. To you islamists out there, know this: I will NOT present my neck to you for chopping, nor any of my limbs. You’ll have to fight me for I will not bow down and worship your rock. You will never convert this Catholic to your abomination of society. I will not submit. Filed under: Michigan State University, Miss Beth, Muslim Insults, Professor Wichman |	Comments Off on Michigan State University and Old Blue Jacket ROCK!